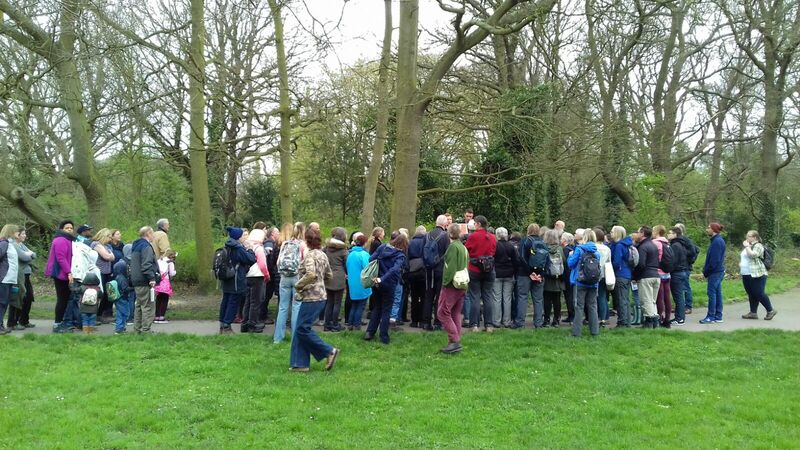 A joint walk by London Wildlife Trust and South London Botanical Institute (SLBI) on 15th April saw 97 people exploring fragments of the Great North Wood from Streatham Common to Crystal Palace. 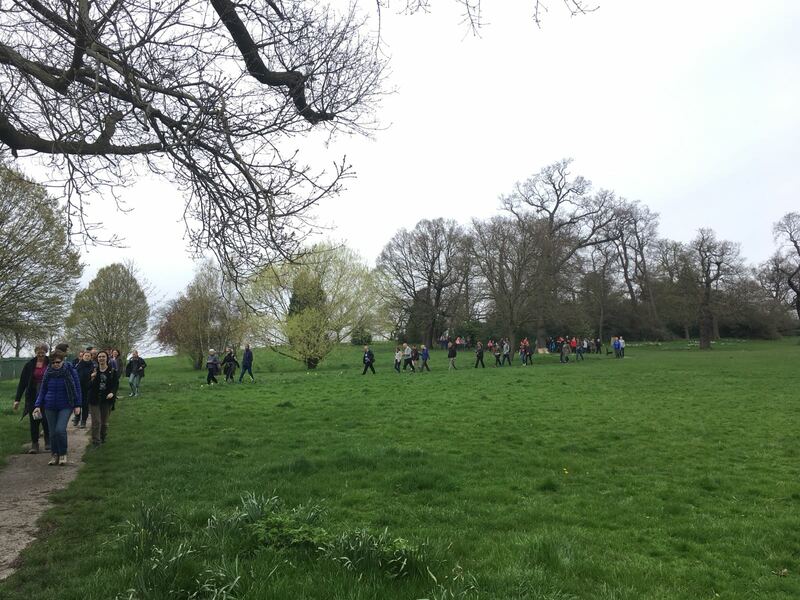 The six-mile route took in six different sites over four hours, led by Sam Bentley-Toon and Edwin Malins from the Trust’s Great North Wood Project and Roy Vickery from the SLBI. Once a large complex of coppice and wood pasture, fragments of the Great North Wood still remain across south London and it also lives on in place names such as Norwood, Honor Oak and Penge (meaning ‘edge of the wood’). 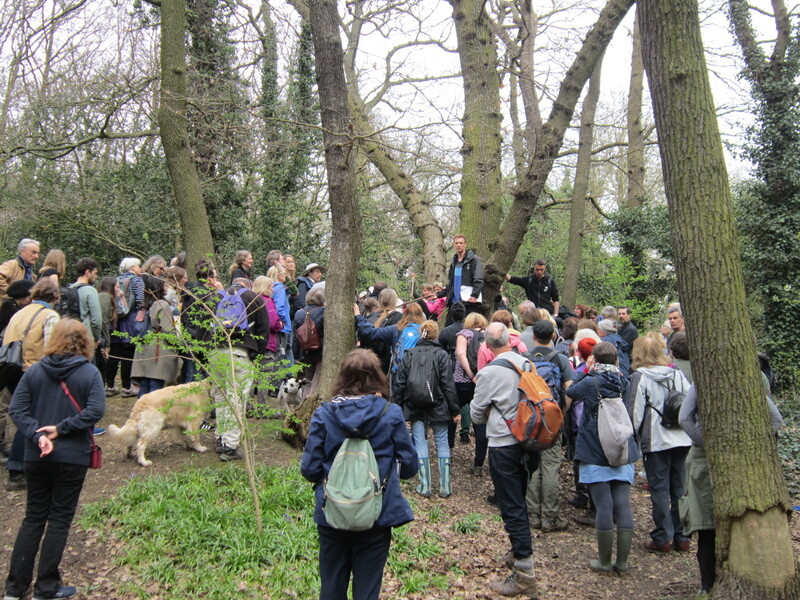 Starting from the Rookery Cafe, the walk passed through Streatham Common Woodland, part of the Local Nature Reserve managed by the Streatham Common Co-Operative (SCCoop). The group discussed the issue of compaction and erosion in the woodland, and the management solutions that SCCoop are implementing in conjunction with the Great North Wood project. The route then crossed into the Borough of Croydon, winding through Norwood Grove and along Covington Way to Biggin Wood. This is an ancient fragment of the Great North Wood where London Wildlife Trust has been working with Friends of Biggin Wood to remove invasive plant species such as cherry laurel and also improve the path network. Roy Vickery talked to the group about the delicate patches of wood anemone and the importance of oak trees in these woods. Further east, the group stopped for lunch at Spa Wood, once the site of the Beulah Spa. This is another site where the Trust’s Great North Wood project has been working with a friends group – the Friends of Spa Wood – to remove invasive plant species that are damaging the health of the woods. Pausing to marvel at the largest oak tree in this part of London, the walk then continued into Grangewood Park and across South Norwood Hill to Beaulieu Heights. London Wildlife Trust’s Emma Pooley then gave a talk on her work surveying London’s hedgehogs with the Urban Urchins project, before the walk continued onwards, concluding at Crystal Palace Station.